UWTI and DWTI are wildly popular 3x ETF’s that track WTI oil. That means they approximate three times the daily move by WTI oil… and there’s a lot of daily volume so there are no weird trading patterns. WTI was up about 0.33% today, which means UWTI should have been up about 1% today… and DWTI should have been down about 1%. But, UWTI was up about 5.5%… while DWTI was down about 5.5%. That makes no sense. I’ve tracked these ETFs daily for years and I’ve never seen this. There are some extracurriculars going on here, most notably it was announced yesterday that Credit Suisse AG is going to shut down the wildly popular UWTI and DWTI ETFs. I don’t think this affected price because if it did, it would have had an equally negative impact on both. Instead, both issues had completely mirrored performance today, just as you would expect — only, the mirrored performance was off by almost 6x! Also, it could have been some kind of rumor out of the “practice” meeting at Doha, but, if that were the case, that would have affected WTI price first, which it did not… WTI was relatively calm today. I’m trying to figure out whether this is one of those rare times when some kind of inefficiency affected price. If that’s true, you would expect a snap back rather suddenly on Monday, possibly an interesting trading opportunity. Problem with that thinking is these ETFs trade in such high volume, that kind of inefficiency is almost impossible. This one certainly has me scratching my head. That’s not a direct quote… just something I read a long time ago that made an impression on me. It’s also what I’ve observed when it comes to the Middle East. Sometimes I wonder — since oil is incredibly sensitive to any comments coming out of Saudi Arabia — and since the Saudis clearly have a cash flow problem these days — whether they’re speculating on the side. In my experience, almost all professions do it… it’s said that an honest bartender only steals 10% of the evening’s take… and that’s why we have insider trading laws and regulators. I can only imagine how ineffective any kind of laws and/or regulators are in an area of the world as wild, wild west as the Middle East. If I was a bad oil guy and wanted to make a chunk of cash speculating in oil in the next few weeks, I would have a “practice” meeting and leak that it was an utter failure. That would send oil plummeting. Then, miraculously, at the final meeting, I would triumphantly declare success, grabbing victory straight from the jaws of defeat… and, of course, sending oil soaring. … as a bad oil guy, short term I would still win on both ends of that horse trade. NOV 30 UPDATE: Well, the timing was a bit off… they mostly waited to about a week before the meeting… but, yes, oil, which had a dramatic move downward in the last few days, is now soaring this morning on the heels of a (still unconfirmed) deal… so there may be bad oil guys in OPEC after all. Go figure. The setup: Since last Friday, it seemed like a deal was completely and utterly dead. First, it was announced the Saudis would not attend the preliminary Monday session, which was viewed as being a negative sign that the Saudis were putting their feet in the ground, including horrible “R” word rumors: That they may be reneging on prior agreements. Then came the slew of press releases stating things like, “the Saudis can go pound sand, we’re not cutting!”… and “we think a freeze right now is the same thing as a cut in 2017″… and such. Then came the last 24 hours where things appeared to be so bad, the Saudi oil minister even resorted to “sneaking in a side door” to avoid having to face the press and other countries. Understand there is a lot of pomp and showing of strength (i.e., “mine’s bigger”) at these meetings so not making a formal entrance was also considered very negative. Magically, though, an agreement — even bigger than what was expected — emerged this morning. And now oil is soaring. I was fortunate enough to spend a weekend with Warren Buffett a few years ago. On the golf course, it was incredibly surreal having Warren (and Bill Gates) cheering on an impossible putt that I almost dropped. But that is a story for another time. Spending any time with Warren, one quickly learns he’s an eminently practical person… he just the type of guy that exudes common sense. So it’s absolutely no surprise to me that Warren would know how to solve the debt crisis in 5 minutes. And, it’s no surprise that I would completely and utterly agree with his plan. Below is an email that everyone is forwarding to everyone… it’s not long and worth reading all the way through… and probably worth pounding our fists on the table for as well! Warren Buffett, in a recent interview with CNBC, offers one of the best quotes about the debt ceiling: “I could end the deficit in five minutes,” he told CNBC. “You just pass a law that says that anytime there is a deficit of more than 3% of GDP, all sitting members of Congress are ineligible for re-election”. The 26th Amendment (granting the right to vote for 18 year-olds) took only three months and eight days to be ratified! Why? Simple! The people demanded it. That was in 1971 – before computers, e-mail, cell phones, etc. Of the 27 amendments to the Constitution, seven ( 7 ) took one ( 1 ) year or less to become the law of the land – all because of public pressure. Warren Buffett is asking each addressee to forward this email to a minimum of twenty people on their address list; in turn ask each of those to do likewise. In three days, most people in The United States of America will have the message. This is one idea that really should be passed around. The BUFFETT Rule – THIS IS HOW YOU FIX CONGRESS! 7. All contracts with past and present Congressmen/women are void effective 3/1/17. The American people did not make this contract with Congressmen/women. Congress made all these contracts for themselves. Serving in Congress is an honor, not a career. The Founding Fathers envisioned citizen legislators, so ours should serve their term(s), then go home and go back to work. Which News Outlet Is Right? Ouch! Data is one of the things that moves the oil market these days. Every Tuesday at 1:30pm pst we get data from the American Petroleum Institute (API). I have found Marketwatch does a great job covering this report — which we mere mortals can’t actually get directly since we don’t pay the big bucks for a data subscription. Yesterday Marketwatch reported a 3.65 million barrel build… compared to a 2 million barrel decline that analysts were expecting. Relatively speaking, that’s a big miss… and would be quite bearish for oil prices. CNBC, on the other hand, reported a 3.6 million barrel build… BUT as compared to analysts expectations of a 1.5 million barrel INCREASE. That’s obviously a less dramatic miss. Technology is absolutely wonderful but still has a ways to go, eh? Guess we’ll find out the true answer when the U.S. Energy Information Administration (EIA) reports at 7:30am pst today. That is, if the news agencies can get the reporting right. UPDATE: The EIA reported that the actual build was 5.3 million barrels… which I’m happy to say both news agencies got right… BUT, Marketwatch still is using an analyst figure of an expected decline of 2 million barrels… while CNBC is still using an analysts figure of a 1.5 million barrel increase. Ugh! Go figure. I’d love to know what the odds of Trump winning were from his very first presidential rally… one I remember like it was yesterday… the one where Trump bragged about “thousands and thousands of supporters” in attendance… but most media reports pegged at barely a hundred or so of allegedly paid participants. The odds had to be astronomical. My take is the American people voted for N-ABC… Not Another Bush or Clinton. People were — are — simply fed up with politicians being, well, politicians. The bad news is our new president is a blowhard. And a spin-meister… someone I feel like I have to fact check every time he opens his mouth. For the sake of the United States of America and the entire world, fingers crossed that the good outweighs the bad. Who’s Better For The Market, Democratic or Republican President? CNBC did a fascinating analysis of who’s better for the stock market, a Democrat or Republican. 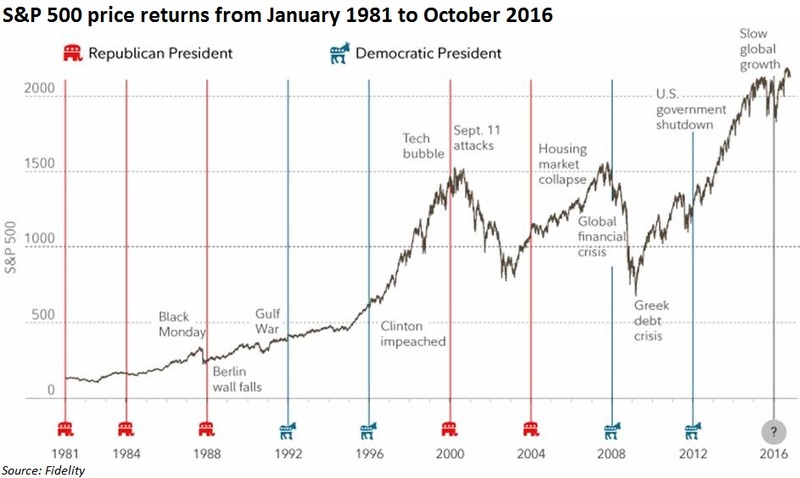 While the initial conclusion here is, “Democrats are better for the stock market”… I believe what these charts actually show is what happens when the Republican party abandons its long-standing partyline of being fiscally responsible. That is to say, while it may have been helpful to the military complex, dragging us into needless and endless and massively expensive military action is simply bad for business. I think the charts below prove that in spades.